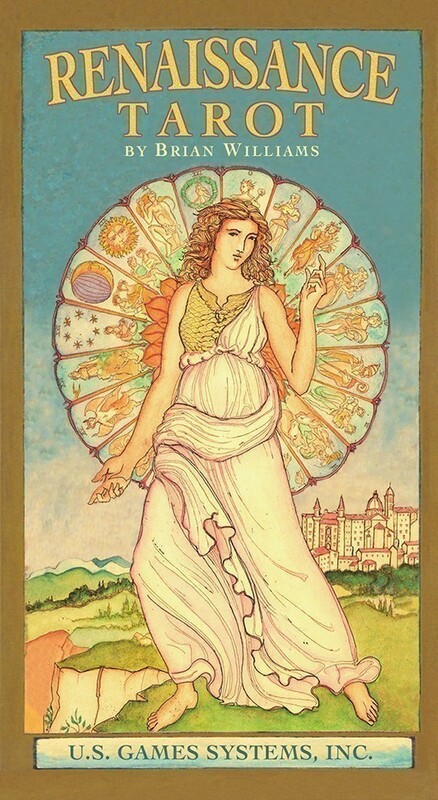 Through the exquisite artwork of Brian Williams, Renaissance Tarot connects traditional tarot symbology to the splendor of European Renaissance culture and classical mythology. 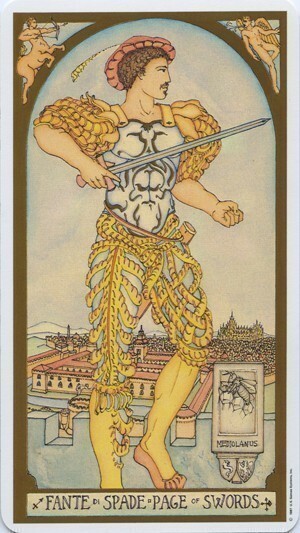 The 22 Major Arcana cards feature the Olympian deities and demi-gods of antiquity. Card titles are in English and Italian. In the booklet, also by classics scholar Brian Williams, each card description identifies both the Greek and Roman deity as well as his related attributes. 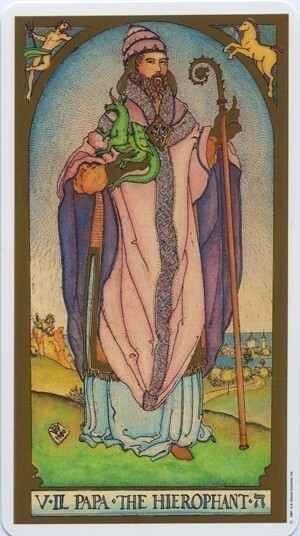 For example, the Fool is associated with Dionysus/Bacchus and the Magician with Hermes/Mercury. The four suits in the Minor Arcana are represented by four classical myth cycles with an interlocking system of planets, constellations, seasons, and elements. Swords relate to Achilles; Staves to Hercules; Cups to Cupid and Pysche; and Coins to Persephone. The great cities of Renaissance Italy are represented in the court cards. 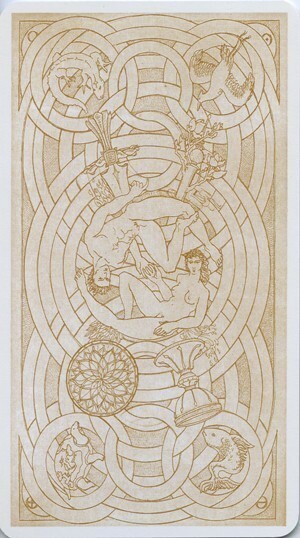 The back design of Renaissance Tarot features a mandala incorporating symbols of the four suits and the four elements. Brian Williams artfully weaves together a rich tapestry of Renaissance imagery. This is one of the most beautiful decks you are likely to find. 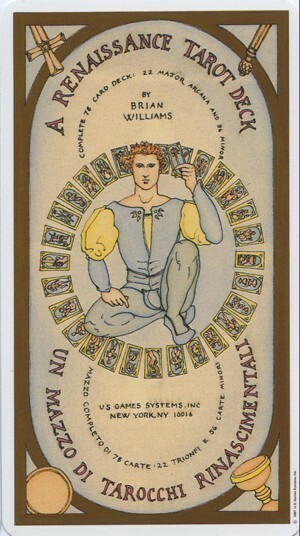 The Major Arcana are detailed etchings, delicately colored and bordered in gold. 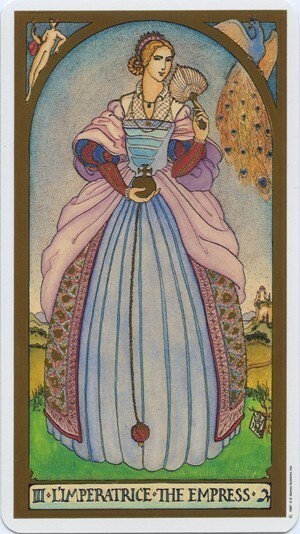 A casual look might make one think that this is a "period" deck, differing from other tarots mainly in the lavish Renaissance costumes shown on the cards. However, it is much more. The artist is a student of art history, in particular the Italian Renaissance, in which the very first tarot decks were produced. This deck captures something of the spirit of those original tarots, in which the Major Arcana were presented as classic, allegorical designs. We've become accustomed to tarot designs laden with 19th-century occult symbolism; this deck offers a refreshing taste of a different kind of tarot, one whose message is open to anyone with imagination and an appreciation of the language of art. There are many references to Greek and Roman mythology in these cards, as well as medieval folklore and philosophy. So there is a lot of symbolic richness here, although it draws from somewhat different sources than many other decks. For this reason, it is a good idea to buy this deck along with the book, which explains the cultural context of the imagery in great detail, with lots of illustrations from art history. I have found this to be a reliable and often stunningly powerful reading deck. Perhaps because the artist has studied so many centuries of western art with an eye for recognizing the tarot archetypes wherever they appear, these cards seem to capture the essential ingredients of the human condition with force and clarity. The suit cards in this deck require a little extra effort, however, being more reserved in dramatic content than those in many other decks. This is a beautiful, powerful deck. Because its inspiration comes from the early Italian tarot tradition, rather than the occult systems of more recent times, I strongly recommend it be purchased along with the companion book, rather than trying to use it with concepts meant for a different sort of deck. I love the colors and symbols of this deck. When I first saw it I was amazed by the details of this lovely deck. 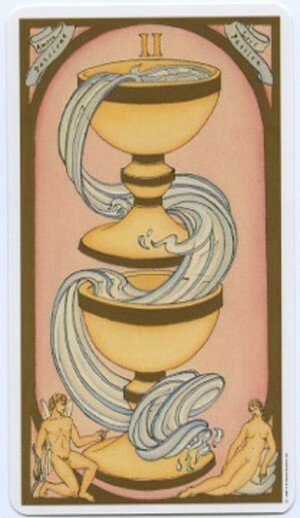 The quality of the drawing and the evocative imagery made me want to use it as my primary deck. I have received many strong readings with this deck, and the questioners are happy afterward. Mr. Williams has a special way of drawing the male and female figure to capture the animus of their spirit. The archetypes are strongly engrained in our collective psyche and the words easily flow from the tableau. This is one of those decks where scanned images just can't do justice for the cards! The cards on the Renaissance Tarot are embellished with a gold foil-like coloring in the images that make them shiny and really stand out. The cards are gorgeous! The Major Arcana cards of this deck portray figures adorned in elaborate costumes and are titled in both the Italian and English languages. The author's intention for this deck was make it both traditional and original, which he indicates can be an artistic challenge to depict traditional truths in a fresh style. The pip cards of this deck remind me of a Marseille-styled deck, featuring the number of suit symbols that correspond to the number of that card. I would have loved seeing full-color scenes like the Majors portray, but the deck is still beautiful nevertheless. Delicately illustrated, with gold embellishments, Brian Williams’ artistry gently hints at illuminated manuscripts while it conveys the power of the tarot symbolism contained within the traditional 78-card deck. 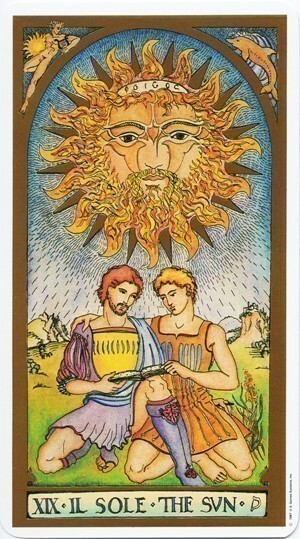 Relying on classical mythology and four of the great Italian Renaissance cities, he has made the tarot his own. The characters display uncharacteristic emotion and, sometimes unfettered sexually, to convey the essence of the tarot wisdom. Ultimately, in this deck, it is the eyes which tell the story. Whether they peer out from the face atop The Tower, from the skeleton in Death, or from the leaves on the flower held by The Priestess, the eyes say it all. It doesn’t matter if you are new to the tarot or a long-term afficionado, this deck will provide many hours of questioning and pondering. It is sad that Brian Williams will not be able to take us further on the journey he has so elegantly begun.His passing was truly a loss to the world of tarot.